Mickey Mouse wants to prepare a delicious apple pie to surprise his girlfriend Minnie but has not yet picked the fruits of the tree. They are already ripe and will begin to fall from the tree, but we can not let them fall to the ground, but they will not have the same flavor and the cake will not come out as well. 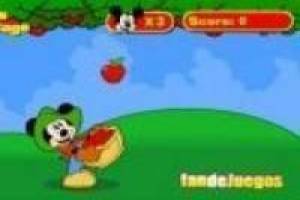 Use the PC mouse to move the famous Disney character and make the falling apples end up inside the basket. You have three lives, if any of these apples fall to the ground you will have lost one of them and you will have one less chance to advance in the game. You must reach a high score, which you must try to overcome in the following attempts. 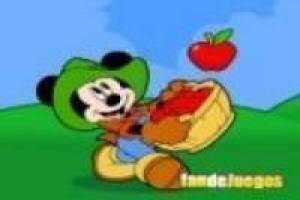 Have fun picking apples with Mickey and his apple trees. 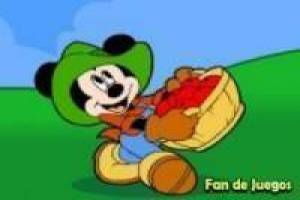 Enjoy the game Mickey and his apples, it's free, it's one of our disney mickey mouse games we've selected.